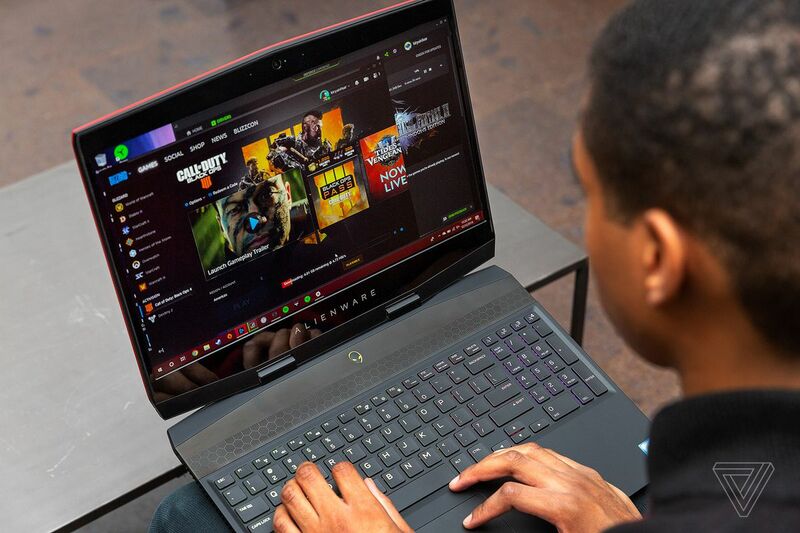 he biggest innovation in gaming laptops in the past year has been Nvidia’s Max Q graphics cards, which allow for much thinner and lighter designs with enough graphical power to run the latest high-end games. These are laptops that you could realistically use all day at the office and then for intense gaming sessions when you get home. 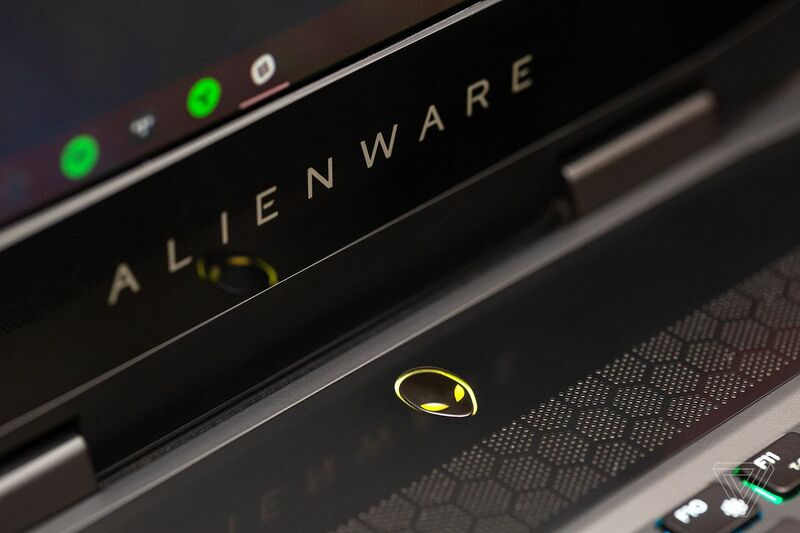 We’ve already rounded up most of the models that have come out over the past year — and RTX mobile graphics are on their way — but Dell’s Alienware brand was missing from the group because it had yet to release a Max Q laptop. The m15 is what fills that gap. It’s Alienware’s first laptop with an Nvidia Max Q card in it. As a result, it’s also Alienware’s thinnest and lightest gaming laptop ever, and it stands out from the rest of the brand’s behemoths. The m15 also comes equipped with a numpad, a broad selection of ports, and even different lid colors. And at $1,379 to start, the m15 costs less than most of its competitors. But this field is intensely competitive, and the m15 is not as thin or as light as the best of the bunch, making it a bit of a tough sell, even at a lower price. 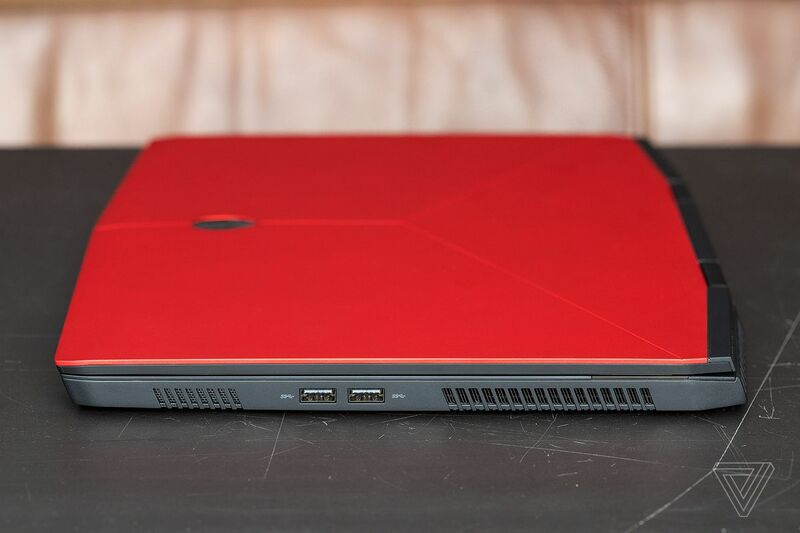 At first glance, the m15 is familiar to anyone who has seen an Alienware machine before: it’s loud and colorful, with hard corners and glowing alien heads. 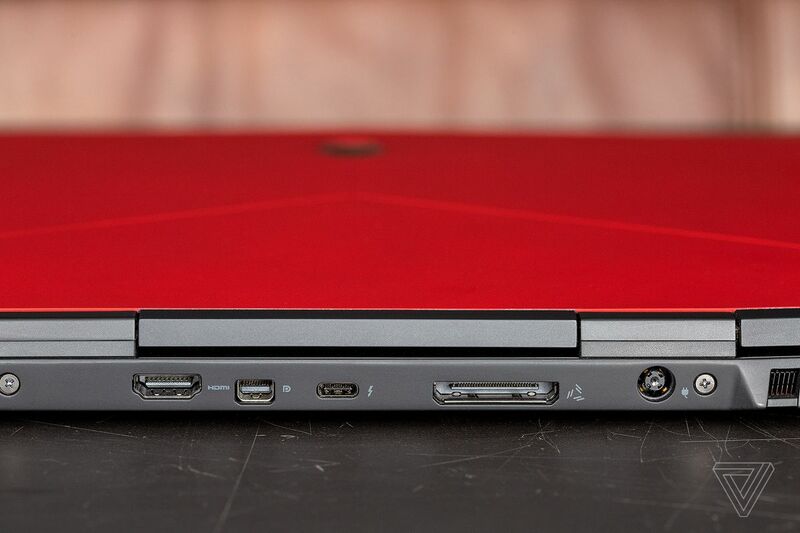 Alienware offers the m15 in red or silver. Somehow, during the course of my testing, it’s grown on me. 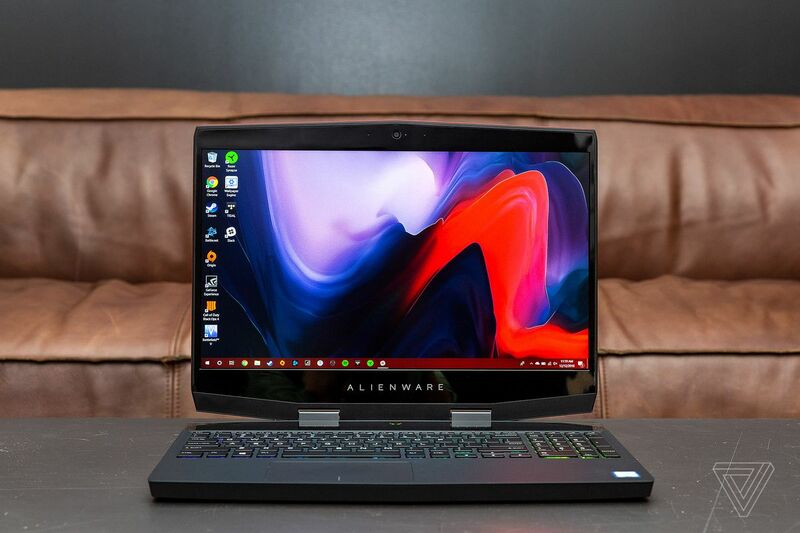 There’s a trend from gaming laptop manufacturers to produce work-friendly Max Q machines that aren’t so obnoxious-looking, but Alienware doesn’t seem concerned about that. 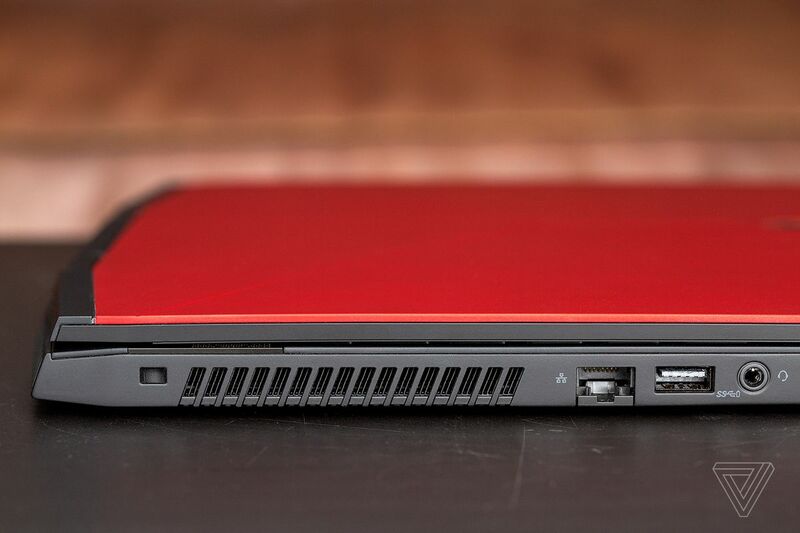 Instead, the m15’s design prioritizes airflow and the tank-like qualities that Alienware machines are known for. As a result, the m15 has plenty of visible air vents as part of its dual-intake and dual-exhaust airflow design. But unfortunately, this doesn’t count for much when I’m trying to use the m15 on my lap. The m15’s chassis gets uncomfortably hot on the bottom, only moderately cooling down when I turn down performance settings in Windows 10. Otherwise, the m15 is best used on a desk. This is far from ideal, and it’s the exact opposite of what so many of the m15’s competitors are capable of. Thankfully, heat doesn’t permeate through the palm rests (which are also fingerprint magnets), but it does become noticeable near the top function row of the keyboard. Although I had similar issues with Razer’s Blade 15, at least the thermal management on its underside made it cool enough to use on my lap instead of ironing my pants like the m15 does. Unlike many of the other Max Q gaming machines, the m15’s aesthetic sticks out like a sore thumb in a work environment, especially in a conference room. In a meeting or cafe, there’s a good chance I would get awkwardly stared at, or, at the very least, be self-conscious that I was using a laptop with a glowing alien head, multicolor keyboard, and red exterior. The m15 weighs 4.78 pounds, measures 17.9 millimeters (0.70 inches) at its thinnest point and 21 millimeters (0.83 inches) at its thickest point. 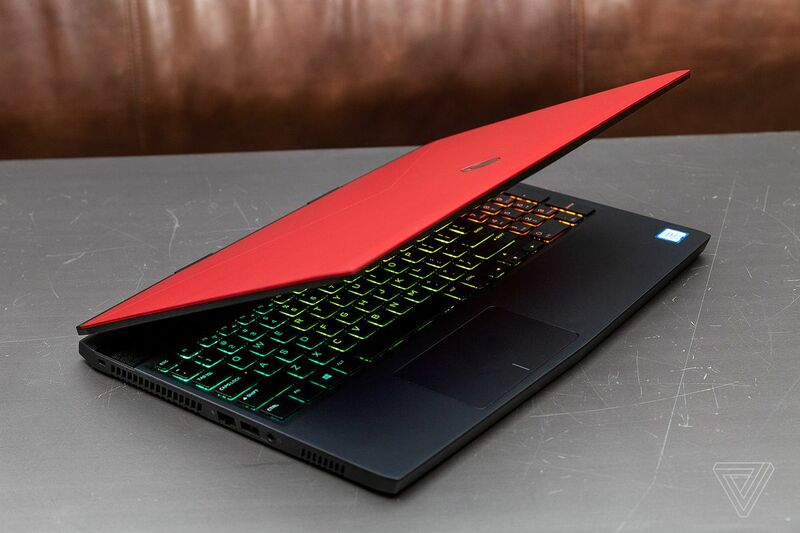 With Alienware’s eccentric styling, its footprint is significantly larger than that of other Max Q gaming laptops. This may be Alienware’s thinnest and lightest laptop, but it’s still chunky and heavy compared to a Razer Blade 15 or MSI GS65 Stealth Thin (which weigh 4.63 and 4.4 pounds, respectively). One area where the m15 bests its competitors is battery life. In my battery test, which included the AlienFX spectrum keyboard lighting, Windows 10’s “better performance mode,” Bluetooth off, and brightness at 50 percent, the m15 would last between five and six hours on a charge. Getting up to six hours of battery life is actually quite good for a gaming laptop, even if it’s far less than most standard laptops can manage. 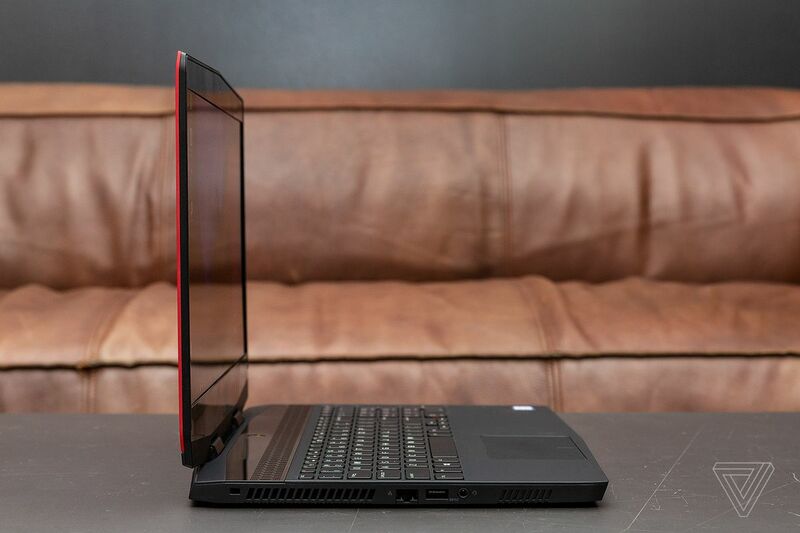 By comparison, the Blade 15 averages around five hours, while the MSI GS65 often taps out just before the six-hour mark. 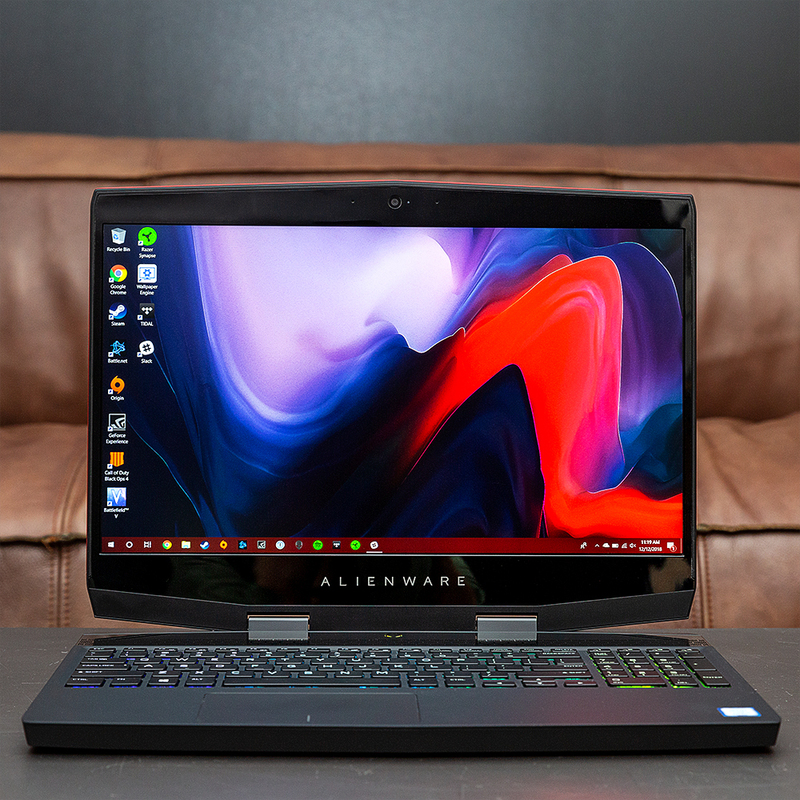 There is one thing about the m15’s design that Alienware completely missed: there’s no way you can ignore the Alienware m15’s huge bezels. Actually, I don’t think I can call them bezels at all; these are huge, plastic borders that don’t even match the m15’s overall design language, and they are so glossy that they reflect your image and collect dust. Even worse, they’re immense fingerprint magnets, are easily susceptible to light scruffs, and, to top it off, they completely kill the sense of immersion when playing games. Additionally, there’s no Windows Hello IR camera around the screen or a fingerprint reader for more secure logins. With all of that chassis space, you would think Alienware would give the m15 more convenient login options than just a four-digit PIN, especially considering it’s nearly a $2,000 machine when fully equipped. On the other hand, the Alienware m15’s screen is excellent: it’s fast, bright, and vibrant. With a matte 15.6-inch, 144Hz IPS display at 1080p resolution, the m15’s screen maxes out at 300-nits of brightness, which is great for indoor viewing but not easily visible if used outdoors. Reflections and environmental lighting in games are detailed and sharp, while the solid blacks made possible by the IPS panel makes watching Netflix a pleasant experience. Viewing angles around the screen are also good, with little to no discoloration when viewed from the sides or top-down. The m15’s screen is not as color-accurate as the Gigabyte Aero 15’s or as immersive as the MSI GS65’s, but it’s a good display that’s capable of all the things it should be. The Alienware m15 with a GeForce GTX 1070 Max Q plays games pretty well. We’ve already seen the Core i7-8750H and GTX 1070 Max Q processor / GPU combo in many laptops from other OEMs like Razer, MSI, Asus, and Gigabyte, with similar performance across the board. It’s no surprise to see the m15 running Battlefield V at a comfortable 80 fps on ultra settings, proving it has performance similar to its competition. Older and less graphically intensive games like Rainbow Six Siege, League of Legends, and Overwatch will all run closer to the m15’s native 144hz refresh rate, with all of the graphical presets maxed out. As a productivity machine, the m15 doesn’t look the part, but it works just fine for typing out long documents, checking emails, and touching up in Photoshop and Lightroom. The Windows Precision touchpad is large, smooth to the touch, and accurate at every corner. It’s rather useless for playing PC games, but otherwise, I don’t have any gripes with it. However, I am a bit disappointed with the m15’s cramped keyboard layout that includes a numpad alongside a regular QWERTY layout. Normally, I’m all for numpads in PC gaming because of the additional mappable inputs — it’s not just useful for filing taxes! — but in the m15’s case, the numpad forced Alienware to further shrink the letter keys that already feel fairly small to begin with. It’s not a deal-breaker, but if you’re like me and prefer having a gaming laptop QWERTY be centered below the screen, then you might not be fond of the m15’s layout. Each one of the m15’s keys supports AlienFX, Alienware’s lighting management app, and can be programmed to display preset color configurations or your custom ones. 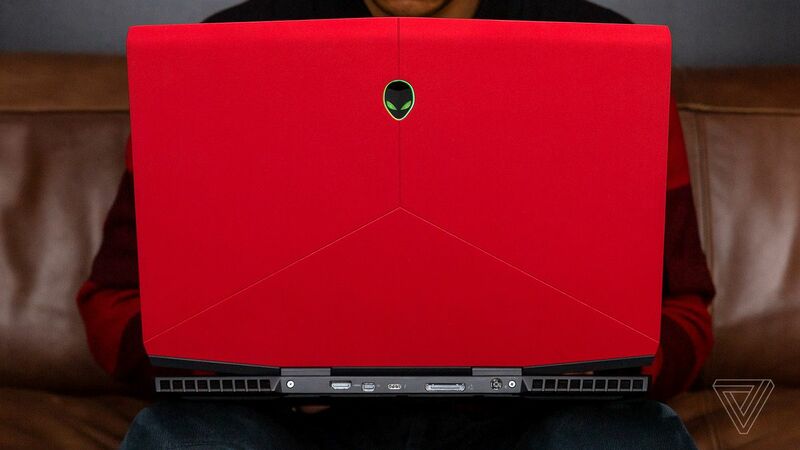 And like previous Alienware machines, you can adjust the alien head logo’s lighting (or turn it off) as well. Otherwise, the keyboard feels average, despite the eye candy and unique font that Alienware has set. Each key has 1.4mm of travel, so actuations are fairly immediate, with enough dampening for comfortable typing. Although I might prefer the MSI GS65’s keyboard over the m15’s, it’s still acceptable.